I harvested winter squash on the fall equinox again this year. Light green Sibley, dark green Burgess Buttercup, Nutty Delica, and Uncle David’s Dakota Dessert and bright orange Eastern Rise and Potimarron are all cured and stored in a cool, outdoor closet while their sweetness develops, but tan and green striped Honey Boat Delicata has been ready to eat for the past several weeks and I’ve been adding the rich, sweet flavor of this perfect little squash to all sorts of dishes. Honey Boat is a delicata variety bred by Dr. James Baggett at Oregon State University. Adaptive Seeds, my source for seeds this year, describes it as “long like a true delicata but with a copper skin instead of the typical yellow. Certainly the sweetest winter squash we have ever grown.” I planted only Honey Boat this year because I’d been a little disappointed with the productivity and flavor of the yellow delicatas from both Fedco and Johnny’s last year. I’m really happy with it and will keep growing it though I’ll also keep looking for another good yellow delicata. 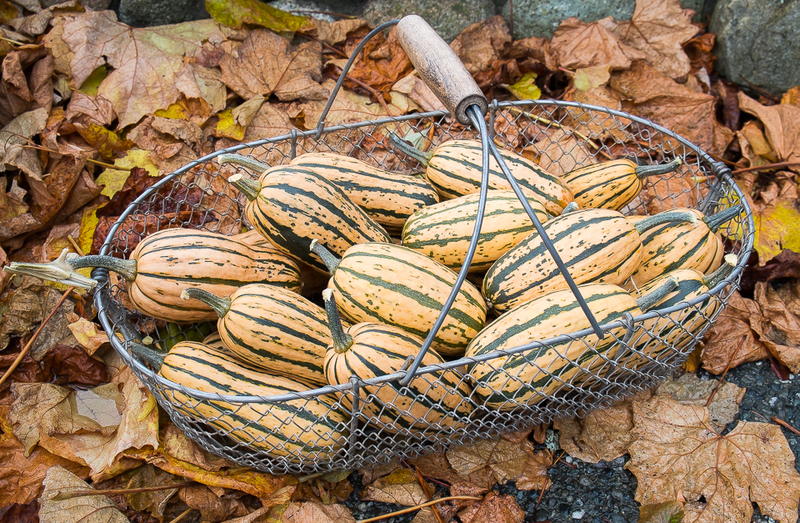 Like all the delicata varieties, Honey Boat has the advantages of small size and thin skin. A typical 12-16 ounce squash serves two nicely. The quickest way to prepare it is to cut a squash in half lengthwise, scrape out the seeds, lightly oil the flesh, place the halves cut-side down on a sheet pan and bake them at 400 degrees for about twenty minutes. Friends of mine tell me that they often stand at the counter and eat these sweet treats right away, skin and all, but when baked delicata halves do make it to the table, they are a wonderful side dish. The thin skin of most delicata varieties is tender enough to eat though I’ve found that the skin of Honey Boat is not quite so tender as skin of other delicatas so I’ve been peeling it. 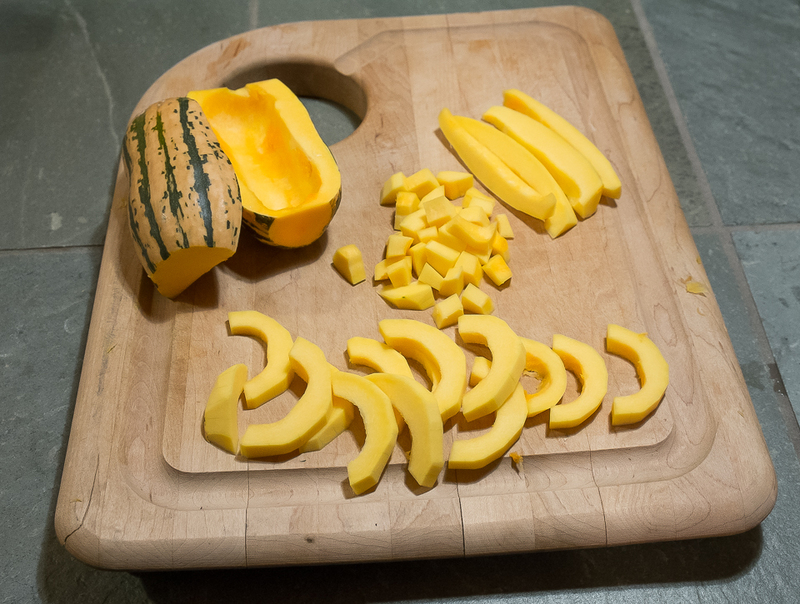 After cutting the raw squash in half lengthwise and removing the seeds, I use a vegetable peeler to skim off the skin. The skinless halves are then ready to cut crosswise into half moons, lengthwise into strips or with one more crosswise cut into dice. Tossed in a little olive oil, spread in a pan, and roasted at about 375, all of these shapes soften and brown in fifteen minutes or so. These little nuggets of rich squash flavor are a perfect served hot as a side dish. 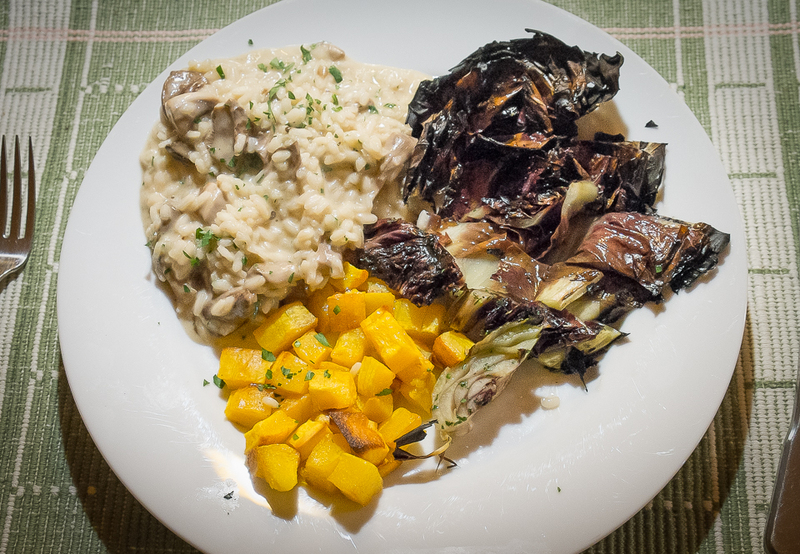 I piled some next to mushroom risotto and grilled radicchio the other night. Diced pieces are also wonderful added to a pasta sauce or risotto. Roasted slices are just as tasty as those very popular sweet potato fries and half-moons are pretty on pizza, topping a base of Gorgonzola cheese. 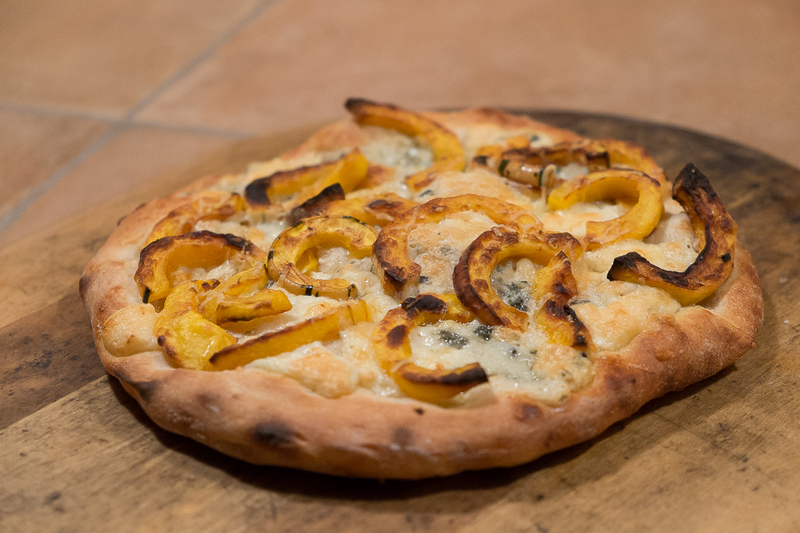 For another cheese combination, emmer farro and roasted delicata squash pieces topped with melted Gorgonzola cheese create a satisfying blend of contrasting textures and flavors. 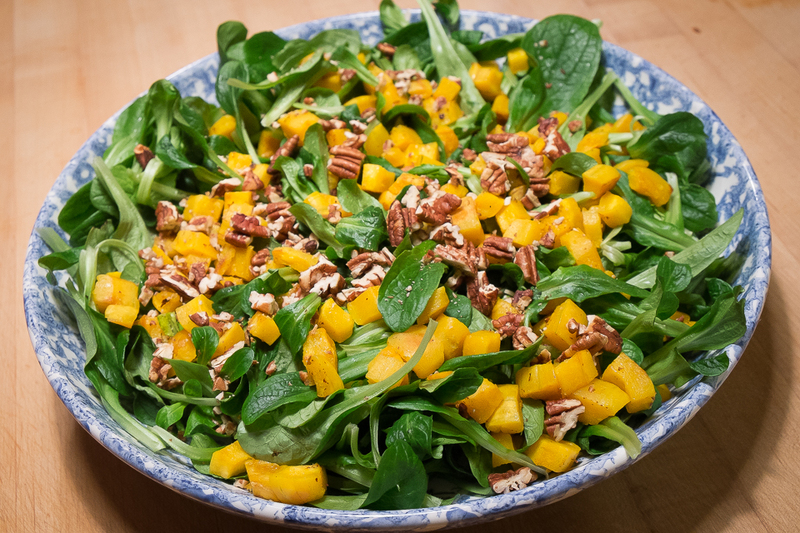 Another delicious way to serve these delicata bits is to cool them to room temperature and toss them into salads. I’ve been doing that a lot this fall, adding them to bitter greens, mache or arugula, mustard or kale or a mixture of these hardy fall and winter greens. In a few more weeks, the big squash will be sweet enough to eat and I’ll start cooking them. Sibley and Burgess will be first and then the rest as we move from Thanksgiving to Christmas and on into the New Year. For now, though, these little Honey Boats satisfy my love of winter squash. And those that are left when I turn to the big squash will stay sweet for several months longer so we can keep enjoying them as fall gives way to winter. 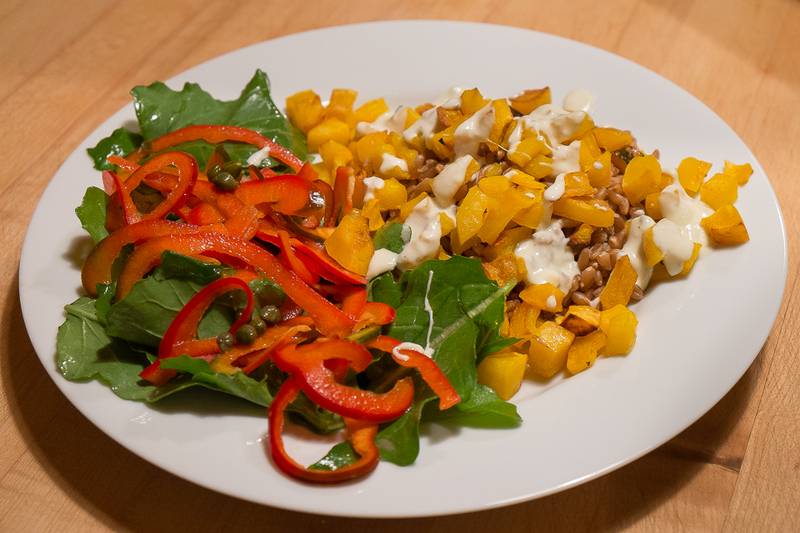 This entry was posted in Fall/Winter Vegetables and tagged Adaptive Seeds, Delicata Squash and Farro, Delicata Squash Pizza, Delicata Squash recipes, Delicata Squash Salad, Honey Boat Delicata Squash by Lopez Island Kitchen Gardens. Bookmark the permalink. Looks lovely! But… I grew honey boat this year and just roasted some, and found it tasteless and a bit woolly. I’m wondering if I harvested too early: there were dark green stripes and yellow/orangey skin, but still pale coloured inside. I can see that people love honey boats so I’m unsure if I harvested too early (ie early August in London, after a really hot and dry few week – the plant has been watered though ), or if I just don’t like them! Thanks for writing. You’re right that you probably harvested too early and also didn’t have them any storage time. Here in the Pacific Northwest of the United States, I harvest most winter squash around the fall equinox and then let them sit in a cool closet for at least 4-6 weeks after harvest before beginning to eat them. They get sweeter the longer they are stored. I usually have some left in January. The texture improves too. I hope you have more that you can store until their sweetness develops!